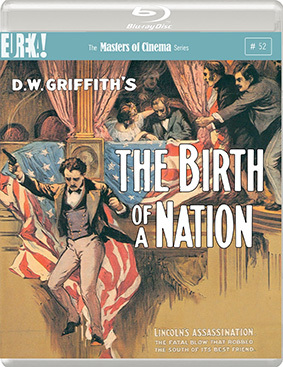 Eureka Entertainment have announced that they will be releasing a new two-disc 1080p presentation (on the Blu-ray) of D. W. Griffith's great and controversial 3-hour silent epic, The Birth of a Nation – often hailed as the first feature-length masterpiece of the cinema. It is the film that invented such commonplace staples of cinema/TV technique: panoramic shots, night photography, panning shots, its own musical score, and was the breakthrough film of one of the greatest actress of the silent era – Lillian Gish. Special features will include short vintage introductions to the film by Griffith and Walter Huston; newly rediscovered intermission and title sequences; seven Civil War shorts by Griffith totalling over 100 minutes in length; and a lengthy booklet with writing about the film, rare archival imagery; and more. It's a film that's deeply divisive even to the senses of a single viewer: images of painterly beauty in composition and tonal quality often exhibit a contemptuous, inflammatory coarseness with regard to subject matter; just as frequently, long tracts evince an innocent, terrifically lyrical grandeur. Griffith would attempt to make amends for the moral schism of this schizophrenic epic in his next film, Intolerance, but The Birth of a Nation cannot – and should not – remain unseen, or undiscussed: it is a great, and terrible, masterpiece. The Birth of a Nation will be released on UK Blu-ray and DVD on 22nd July 2013 by Eureka Entertainment as part of the Masters of Cinema series at the RRP of £17.99 for the DVD and £19.99 for the Blu-ray.